Narendra Modi in Wardha; Lok Sabha Election 2019 campaign LATEST updates: In the rally in Maharashtra's Wardha, referring to the verdict of acquittal of the accused in the Samjhauta Express blast case,..
▶ Videos for "Samjhauta Express Blast Case"
PM Modi on Monday targeted Congress over coining the term “Hindu Terrorism” without naming the Samjhauta Express blast case. 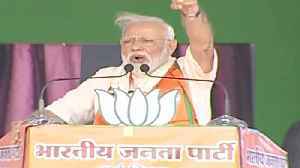 Modi said Congress has insulted the peaceful Hindu community by..
At a media briefing, MEA spokesperson Raveesh Kumar said due process was followed in the 2007 Samjhauta Express blast case and the court has given the verdict based on materials available to it. India said that Pakistan must take "immediate, credible and irreversible measures against cross border terror without any discrimination and wthout resorting to such gimmicks." A special court in Panchkula in Haryana had acquitted the Samjhauta Express blast case main accused Swami Aseemanand and three others in the case on Wednesday. Before giving the verdict, the judge.. The NIA court also dismissed an application filed by Pakistan national Rahila Wakeel to depose in the case as an eyewitness, which brought in a curious twist to the 2007 case. The blast in Samjhauta Express took place near Panipat in Haryana on February 18, 2007, when the train was on its way to Attari in Amritsar, the last railway station on the Indian side. An Indian court on Wednesday acquitted four Hindu men accused of bombing a train between India and Pakistan in 2007 that killed 68 people, mostly Pakistanis, citing a lack of evidence, defence lawyers.. The court dismissed the plea of Pakistan woman seeking to depose in the Samjhauta Express blast case. On Thursday, a Pakistani national moved an application asking to depose in NIA special court in Panchkula. A special National Investigation Agency (NIA) court will on Thursday pronounce the order in Samjhauta Express blast case. The blast hit the Samjhauta Express train on February 18, 2007, killing 68 persons, most of them Pakistan nationals. A Pakistani woman Monday moved the anti-terror court here trying the 2007 Samjhauta Express blast case and sought examination of the blast eyewitnesses from her country. According to NIA, the blasts were carried out with the help of IEDs and inflammable substances. A special National Investigation Agency (NIA) court, here on Wednesday, said it would pronounce verdict in the 2007 Samjhauta Express blast case on March 11. Chandigarh, June 21 (ANI): Creating a stir while sharing his views on 2007 Samjhauta Express blast case, Haryana Minister and BJP leader Anil Vij on Wednesday said that a Hindu can't be a terrorist and..
New Delhi has handed over to Islamabad summonses issued by a special NIA court to 13 Pakistanis for deposing as witnesses in connection with the 2007 Samjhauta Express blast case in which 68 people..
Aseemanand was recently acquitted in the Ajmer blast case and is on bail in the Samjhauta Express blast case. A special NIA court today summoned 13 Pakistani witnesses for deposing before it in connection with the 2007 Samjhauta Express blast case in which 68 people were killed. New Delhi, Mar 16 (ANI): Retorting to Pakistan’s comment dubbing acquittal of right-wing activist Swami Aseemanand, an accused in the deadly 2007 Samjhauta Express blast case, as "regrettable", the..
India on Thursday asked Pakistan not to meddle in its internal affairs after the neighbouring country protested against the acquittal of former RSS activist Swami Aseemanand in the 2007 Ajmer dargah..
*Right-wing activist Swami Aseemanand was today acquitted along with six others in the 2007 Ajmer blast case by a special court here, which convicted three others. * Judge Dinesh Gupta let off Swami..
*Sadhvi Pragya Singh Thakur and seven others were acquitted in the 2007 RSS pracharak Sunil Joshi murder case today by a Madhya Pradesh court, which held the state police and NIA conducted the probe..
Main accused in the Samjhauta Express blast case, Swami Assemanand, was today granted bail on a personal bond of Rs 1 lakh and two surety bond of Rs 1 lakh each. Stepping up attack, Congress on Sunday alleged "direct interference" of PMO in the "sudden reversal" of NIA's stand in the 2008 Malegaon blast case and pressed for a Supreme Court-monitored probe into..